The Montreal Children’s Hospital treats at least 90 children with trampoline-related injuries every year. Most of the injuries occur on backyard home trampolines. Common injuries include broken bones or dislocated joints (which frequently require surgery) and traumatic brain injuries. In some cases, more serious injuries to the neck or back can occur and cause paralysis or death. In 2007 , the Canadian Paediatric Society and the Canadian Academy of Sport Medicine issued a position statement (reaffirmed on January 30, 2012) recommending that trampolines should not be used at home or in playgrounds as they may cause serious injury. In 1997, the Trauma Programs of The Montreal Children’s Hospital issued an alert about the dangers of trampolines after a teenager died from a very severe brain injury. At that time, the Coroner’s report recommended to Quebec’s Education Department that if rigorous supervision is not possible in school gymnastics programs by trained instructors, the programs should not be offered. In 1998, the Quebec Federation of Home & School Associations called for a resolution banning trampolines from schools and municipal parks. The Canadian Hospital Injury Reporting and Prevention Program (CHIRPP) reported that 2,705 children were treated in emergency departments in Canada for backyard trampoline-related injuries between 1999 and 2003. Trampolines are gymnastic equipment and must be respected as such. Backyard trampolines are not recommended. Serious injuries have resulted when backyard trampolines were used as a launch pad. 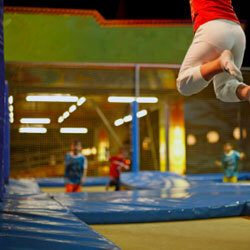 Most injuries occur while jumping on the trampoline, not from falls off of it. Only one person on the trampoline at all times. Never attempt flips or stunts without training. Never allow kids to play on a trampoline unsupervised. Surrounding surface should have an impact-absorbing safety material. Follow manufacturer's recommendations for the number of participants. Consider swimming ability and size of participants, especially if used as a launch pad. Have trained spotters in close proximity.